The Discovery Channel "Flight 370"
Set up by Dan Sollis, DD is a boutique visual effects company producing work for the Film, Television, Music and Video Game industries. Principle areas of expertise include Editing, Video compositing, Motion graphic design, 3D CG modelling, animation and title design. We're based in Soho, London and are part of the Precinct collective. 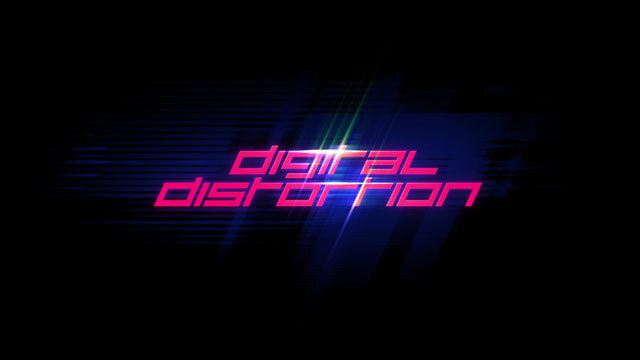 But I'm very aware at how ancient and crusty the Digital Distortion website is, so you'll be pleased to hear that a new wordpress-based version is planned, with revised content, tutorials and more cool stuff. But perhaps more importantly, I'm also rebranding. It's an evolution of the existing brand, but taken waaaaaay far out to a neon 80s dimension. Where Lambourgini Countach's race through the night down rain-slicked LA streets, the trails of their rear lights reflected in the sunglasses of men in white suits and women in shimmering cocktail dresses. Its more than just a logo though. It's a lifestyle. The next showreel done using this is going to be quite special. I hope to get it out there soon, I'm dying to show you what I've been cooking up! So - check it out! In the meantime, here's a recent promo we completed for The Discovery Channel. It's all 3DCG, and was turned around insanely fast in order to meet a brutally short deadline. It all turned out good though - feast your eyes on it here! BBC Radio1xtra - Attack of the BassPhone! I'm super excited to show the latest CG meisterwerk done in collaboration with long-term friend (and super-creative director) Robert Samuels: A 30 second promo created to advertise both the Charlie Sloth show on Radio 1XTRA and the show's new availability via a mobile phone app. The entire scene - including the table and environment - was CG. Check it out! I upgraded my copy of Trapcode Suite recently, so finally had a chance to have a proper play with the new plugin "Mir". It's an odd plugin for sure, but a lot of fun to play with. I created a desert city scene using it and rendered out some animation which I then cut to music. Check it out here - and if you want to see how it was made, the project file can be downloaded from that page too. 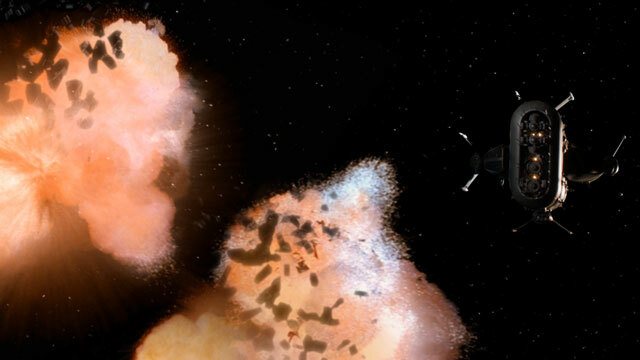 Did I mention that we did VFX for one of the episodes of the new series of Red Dwarf? Episode 6 got a lot of VFX love from Digital Distortion. There's a few screen graphics by us in Episode 4 too (showing tomorrow evening). More details coming after episode 6 airs - wouldn't want to spoil it! it is done. After many months of toil, my live-action directing debut is done. My thanks to an awesome crew who helped me on this journey and I hope you like the end result! The new version of Trapcode Form has been released and has a bunch of neat new features. I've done a little test using the new OBJ import support. Go and take a look at it here - and grab the project files too if you want to have a play! UPDATE: a second, more complex Form 2 demo is now available. This models a galaxy, using an OBJ point cloud generated in Lightwave. As before, project files are available to download for free! Get it here. I've just noticed that the Autoreplace from Folder script I created a while back, doesn't work in After Effects CS5. A bit of digging revealed that Adobe have finally killed off some deprecated File Dialog functions, so I'm updated it to work with the new methods. I've also added a small but handy feature to allow you to specify the max length of the filename to evaluate for searches (you can limit it to cut off any mangled characters added to the end of file name references by AVID and others). This is a really handy script if you're conforming an edit in After Effects, so go here and grab it now. Long overdue, but I've finally updated the site with some of our latest (and greatest?) work. Most notably, a motion graphics project we did for BBC1HD. This is just about as complex as it gets for After Effects graphics and it made heavy use of Trapcode Form and Particular to generate some really dense 3D particle effects. A new scene to download and play with. I've just completed a TV ident for BBC1HD which used Trapcode Form extensively. I used some of the knowledge I gleaned from the creation of it to create this new spacey little animation. Take a look and download the project file for free from here. See it and download the project file for free from here. You're welcome! While we're waiting for our Internet connection to be set up in the new office (nightmare! ), I've used the downtime to update the DD website to fix a longstanding gripe. When I did the last major rebuild of the DD website in 2004, Flash was such an entrenched standard that using it for the navigation of what is otherwise a pure HTML site wasn't an issue. My, how times change. Mobile Internet browsing *cough* iPhone *cough* has transformed how people access most websites and Flash (which has always been a very CPU-intensive plugin) is most definitely not a good fit for the limited spec of these devices.